The Intel Pentium M family of processors have great compatibility, and benchmark extremely well, with audio and music applications, but they produce far less the heat than equivalent desktop processors. Less heat means less cooling means less airflow means less acoustic noise. Unfortunately, until recently, these excellent chips have only been supported by notebook PCs and expensive, specialist, small form factor motherboards. This situation has changed: there is now an adaptor that lets us fit Intel Pentium M processors onto Asus� Socket 478 desktop motherboards. 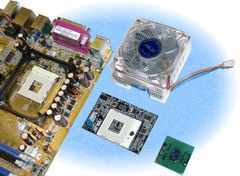 It�s brilliant: this means that you get all the features of a proper top quality desktop motherboard, but in a system which can be virtually silent! Combine this technology with our acknowledged expertise in designing quiet machines. This must now be the best platform for ultra-quiet studio PCs. Described below, our ePC6070-II enclosure includes extra metalwork and case modifications, plus strategic acoustic damping, to produce a superbly quiet PC system unit optimised for the Pentium M CPU. The CPU cooler fans and three case fans are replaced with ultra-quiet models. All these fans can be controlled by an optimised version of our exclusive central airflow control system. 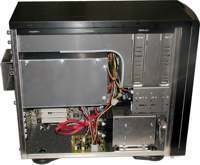 The quiet hard drives are installed in special acoustic mounts and an ultra quiet, quasi-fanless power supply unit is employed. The Lian-Li PC6070 closely resembles the well-regarded PC-6X series, but it has a detachable hinged extruded aluminium door panel with a rubber gasket. Two front-mounted USB 2.0 ports are still included. There is no top fan on the PC6070. Because of the door, the PC6070 has its air inlet on its underside at the front. To accommodate this arrangement, the case is raised on four weird plastic feet. The air inlet is provided with a dust filter, accessed by removing two thumbscrews. In order to make the case even quieter, as supplied by Lian-Li, both the side panels and the top are fitted with sound damping foam material on the inside surfaces. In our modified ePC6070-II case, the metalwork of the already excellent PC6070 case has been enhanced to strategically direct the airflow, so that the cooling of the system is commendably efficient. The acoustic damping has been augmented, to make the system even quieter. 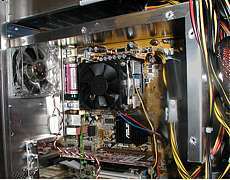 The outlet fan serves an aluminium baffle box, which partially encloses the CPU and the upper part of the motherboard – to aid good operation of the power supply. Our exclusive central airflow control system makes sure that the fans work together efficiently, while not running faster and noisier than necessary. The three 80mm Lian-Li case fans have been replaced by ultra quiet C-Series 80mm AcoustiFan units. The CPU cooler has been fitted with a DustPROOF 70mm AcoustiFan. These fans are very quiet, efficient and offer a superb speed range. The outlet fan is installed with Acousti silicone composite fan vibration isolation mounts, and a cowl is fitted to direct warm exhaust air away from the PSU fins. The SilentMaxx PSU is left to take care of its own fan speed. All of the other five fans are controlled by the central airflow control system fan speed controller, designed and built in-house. 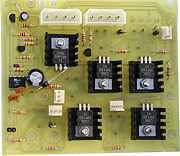 The configuration and set-up of this module is the result of a good deal of experimentation. Although my module can support up to four temperature sensors, I have elected to use a simple configuration with a single thermistor, attached with a clip and bonded to the CPU heatsink. I have found this configuration to be more than adequate. For the current Pentium M desktop systems, we set the central airflow control system to hold the CPU temperature to about 55°C. The purpose of the inlet fans is to maintain a positive air pressure inside the case, and to provide cool air to replace the warm air expelled by the outlet fan. There should be a pressure differential across these fans. It is therefore advantageous that these fans be gasketted and provided with decent baffles. These fans are installed with Acousti AFG80C Anti-vibration Silicone Fan Gaskets, which provide some acoustic isolation and seal the gap, preventing feedback airflow. Aluminium parts have been made to improve the baffle around these fans and create a well-isolated low pressure chamber in front of the fans (between the chassis and the front panel), which will draw cool ambient air in through the filter on the bottom of the PC6070 case. One of the baffle parts is removable to allow installation of the front-panel USB port cable. The other baffle part fits into a neoprene foam gasket bonded to the PC6070 front panel. Additionally, the apertures in the front of the PC6070 chassis, around the inlet fans,have been filled, to ensure the efficient working of the inlet fans. Nowadays, hard drives dissipate quite a lot of power, so cooling is definitely an issue. The inner hard disk drive rack in these Lian-Li cases is very well located, in the direct path of the cool air from the inlet fans. The hard drives stay wonderfully cool – I like this a lot, as excessive temperatures can easily cause modern high-density hard drives to malfunction. We modify the Lian-li HDD rack so that it can take two drives in SilentMaxx Aluminium HD-Silencer hard drive caddies, which offer good cooling and excellent acoustic isolation, as they fully enclose the drives and are supported by rubber AV mounts. 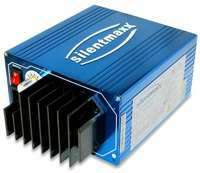 The Silentmaxx Semi-Fanless 450W PSU is heavy, with enormous heatsinks (including fins which project out of the back of the machine) and lots of ventilation holes. It will usually operate in fanless mode, which is genuinely silent. 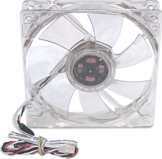 If the power supply does get hot, the fan will turn on, which protects the PSU from overheating. The threshold temperature for the fan can be set to '50°', '60°', '70°' and '80°'. We have set this to 70°, but in our frugal Pentium M-based configuration, we have yet to see the fan come in play. Even when it does, they promise a very quiet 12dB(A). We have made three custom case modifications, to accommodate the semi-fanless PSU: the baffle box, the fan cowl and a set of holes in the PSU mounting channel - see below. The upper part of the motherboard (with the CPU, memory, and part of the chipset and heat from the graphics adaptor) is partially segregated in an aluminium baffle box. This prevents the heat from these components from rising straight into the PSU, while leaving ample room for passive convective airflow through the underside vent holes of the PSU; these vent holes are left fully unobstructed. The baffle box has a removable cover, to provide easy access to the enclosed components. All sides of the baffle box are finished with AcoustiPack foam dampening material. 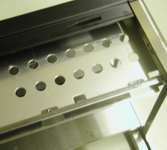 The case outlet fan serves the baffle box, removing the heat generated by the enclosed components. The case outlet fan is fitted with an aluminium cowl, which directs the warm air (drawn from the baffle box) away from the external heat dissipation fins of the semi-fanless PSU. This should help the PSU to remain operating in its silent fanless mode. On the right hand side of the PSU (as viewed from the front of the machine) there are numerous vent holes. The corresponding part of the case PSU mounting channel has been drilled with large holes to admit air to the PSU. 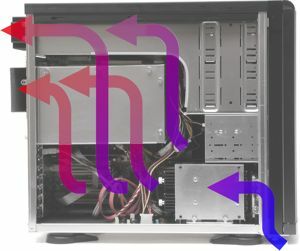 This air comes from the left hand side of the case, which has no heat-generating parts. 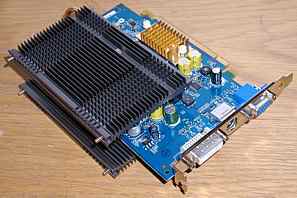 The secret of being able to use a Pentium M processor in a socket 478 desktop motherboard is the Asus CT-479 CPU Adaptor; this requires a non-standard mounting cpu cooler, which is part of the adaptor package. The fan supplied with the Asus cooler does not have the speed range required to make the most of our central airflow control system. We sort this out by replacing the fan with an AcoustiFan DustPROOF 70mm, which is very efficient and quiet, and an excellent match for our fan controller circuit. As the performance of graphics cards progresses it is less easy to find models without fans – that is, with passive heatsinks. In some cases, cards with fans can be modified by replacing the noisy active heatsink with a large passive model, such as the Zalman ZM80C-HP. This device incorporates a heatpipe. As graphics performance is very unimportant in a music PC, and we want to keep overall power consumption down, we prefer to choose a model with a simple passive heatsink.